What's in our Crispy Deep-fried Pork Belly. How we make our Crispy Deep-fried Pork Belly. 1) Cut the pork belly into 1 inch by 6 inch strips. 2) Heat a pot of water until boiling, then add salt and vinegar. Add the pork belly and boil it for 10 minutes. Remove and drain the water well. 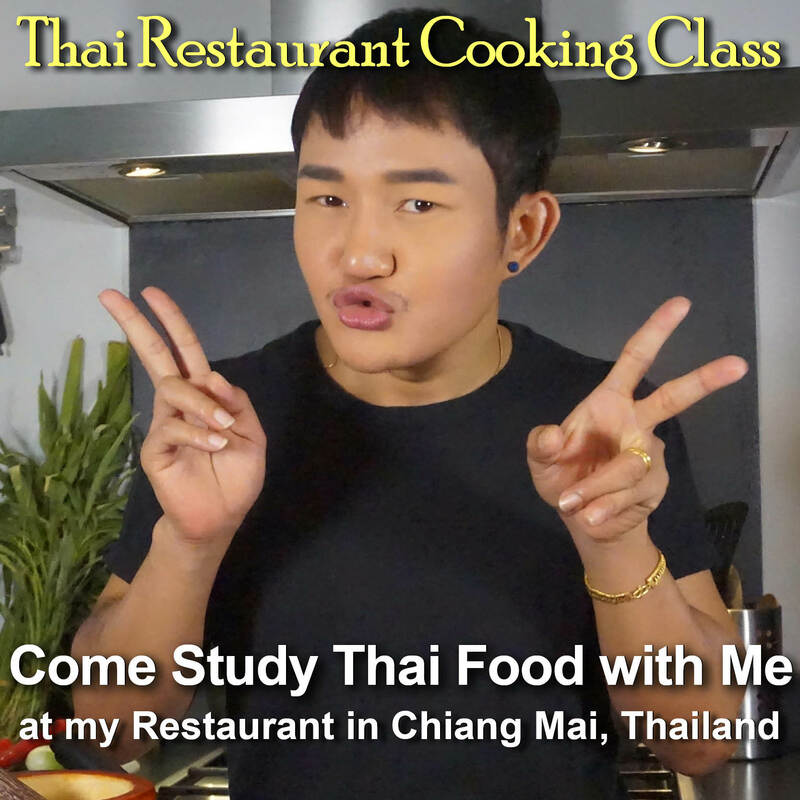 3) Heat oil to 140° C in a deep fryer or large wok. Fry the meat until lightly browned, or about 8 - 10 minutes. Remove and drain. 4) Raise the heat in the oil to 170° C. Add the partially fried pieces of meat. Fry for about 2 - 3 minutes until crispy brown. 5) Let cool completely before cutting. 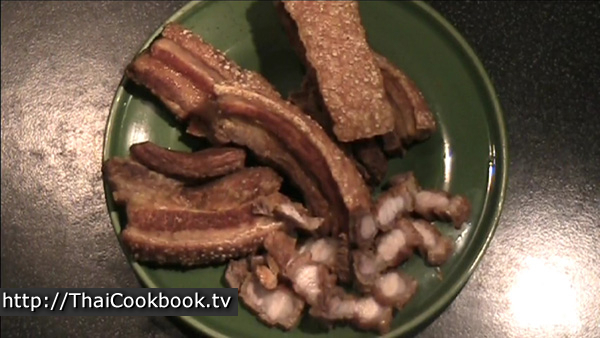 Select a nice piece of pork belly that doesn't have a lot of fat. 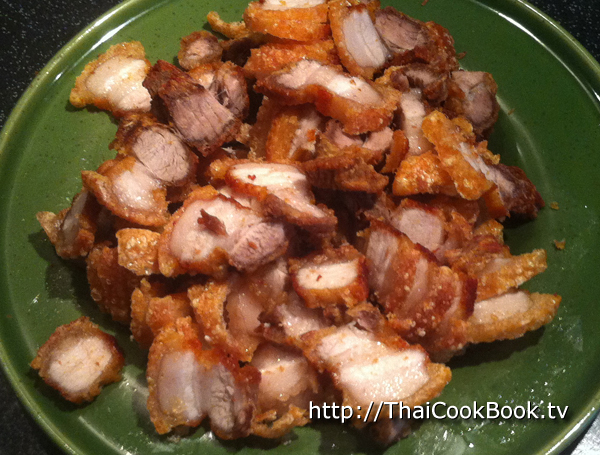 A very fatty pork belly will make very greasy Moo Grob. It should have several layers of nice pink meat and just a little fat below the outside skin. Slice the pork belly into pieces about 1 - 1/2 inches thick, then cut the length if needed so the pieces are not too long for your pan. I usually make them about 6 inches long so they are handled easily when frying. Depending on how much meat you are doing at one time, boil enough water to easily cover it, adding 1 tablespoon of salt and 1 tablespoon of distilled white vinegar for each quart of water. Par boil the pieces of pork belly for about 5 - 10 minutes, and keep checking it so it doesn't over-cook. You really just want to seal the outside of the meat. If it gets too soft the Moo Grob will be soft even after frying. When it's done, the meat will still be very firm, and just a little of the fat will have been cooked away. Let the pieces of meat dry very well before you start frying. Heat some oil in a pan deep enough so you can completely submerge the pieces of pork belly when frying. If you have a deep fryer, that's even better. I use a deep frying pan with about 1 quart of oil so I can do all of it at the same time, but you can use a smaller pot with less oil if you do the pieces one at a time. Don't let the oil get too hot. Just keep the heat on medium, but keep checking so it doesn't burn. If you cook it too fast the meat will be too soft on the inside. It should cook for about 10 minutes or so. Keep the pan covered and open it carefully, as there might be a lot of popping and exploding as the meat cooks. When the frying action starts to slow down and the meat is turning a nice golden brown, remove them from the pan. You'll notice that the meat might be a little rubbery, greasy, and not crispy at all. We're going to fry the meat a little more, but in the second cooking the oil has to be VERY HOT. Turn up the burner all the way, and wait until the oil is so hot that it's smoking a little. After the oil is too hot, carefully put the meat pieces back in the pan. This time you'll notice that they immediately get puffed up and the skin gets crackly like deep fried pork skins. Let them cook for about a minute, then remove them to the cooling rack. As they cool they should be nice and dry and not oily at all. The skin should be rough, hard, and bubbly. 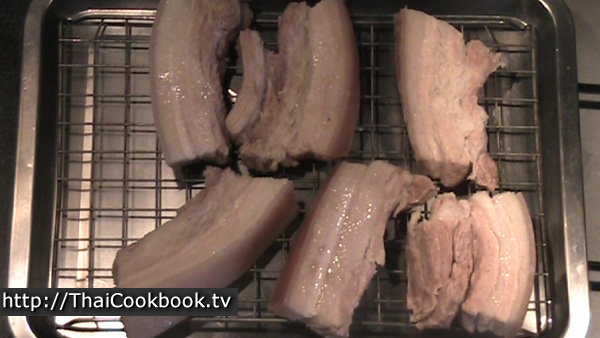 After it cools to room temperature, you can cut the pork belly into thin slices. It's all a matter of taste, but we like to keep the pieces small. Knives are rarely used when eating Thai food. Your Moo Grob should be soft and moist on the inside, the skin should be hard and crispy, and the sides should be brown and crunchy. There should be at least 3 distinct layers of meat and fat on each slice. If there is, then you've done everything right. You can keep Moo Grob in the refrigerator for up to a week. You should cut it into small pieces as needed so it stays moist inside. 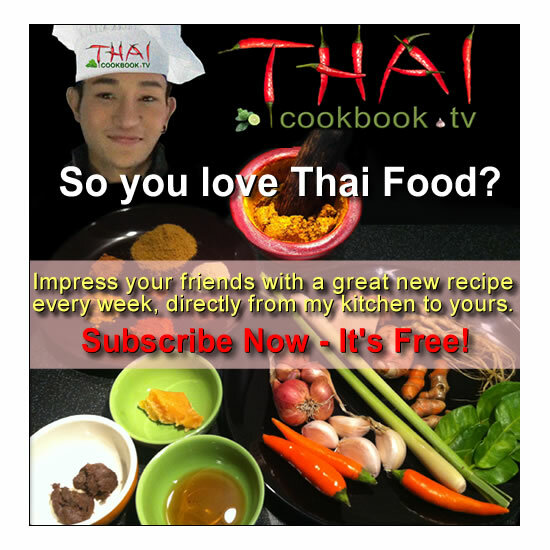 To find out how to use Moo Grob, other than just eating it by the handful, see our recipes for Pad Kaphrao, Pad Kana, and Pad Phrik Pao. Moo Grob makes an excellent meat alternative in these dishes where fresh sliced pork or chicken is normally used.